Buying real estate can be simpler and more straightforward than you think. 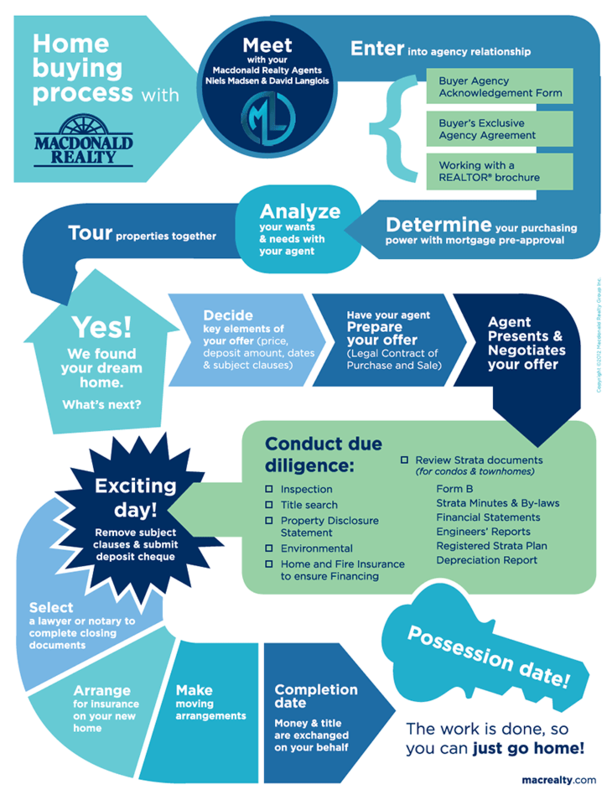 Have a look at our Home Buying Process chart below to learn more about our process and familiarize yourself with the details. If you already know what you're looking for, make yourself a property search account using the form below. You'll receive notifications whenever a property that meets your criteria hits the Victoria market, before it shows up on most real estate websites. There's no spam, no charge, and no upsells — only the homes you're most interested in! Your own private web access featuring just the listings you want to see. Sign up and create your own personal search on MLS®, the same system available to real estate agents. See homes and other real estate before the information reaches public sites. Your personalized property search will be updated in real time. You'll be notified instantly if there are any new listings that meet your criteria, or price changes on properties you follow. Organize and save your favourite listings, print them, or e-mail them to your friends.